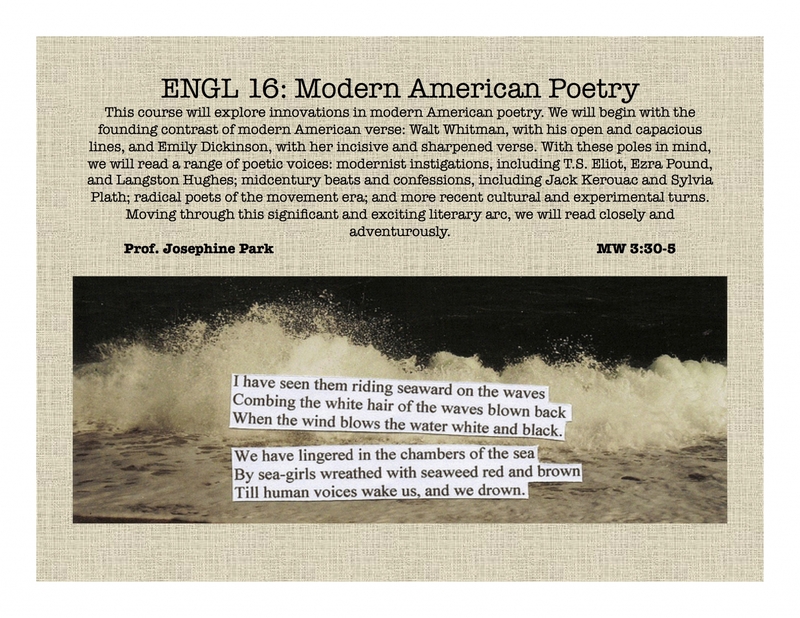 This course will explore innovations in modern American poetry. We will begin with the founding contrast of modern American verse: Walt Whitman, with his open and capacious lines, and Emily Dickinson, with her incisive and sharpened verse. With these poles in mind, we will read a range of poetic voices: modernist instigations, including T.S. Eliot, Ezra Pound, and Langston Hughes; midcentury beats and confessions, including Jack Kerouac and Sylvia Plath; radical poets of the movement era; and more recent cultural and experimental turns. Moving through this significant and exciting literary arc, we will read closely and adventurously. Course requirements: active participation and three short papers.